Reedham is a pretty riverside village found on the banks of the River Yare, around 10 miles from Great Yarmouth. It's proximity to the seaside town makes it a popular stop off point for those who need to wait for the tide to flow out enough to enable passage through the bridges at Yarmouth. However Reedham is not without it's own navigational problems. Here the tidal current runs quite fast at times and you will need to approach the moorings against any running tide. That means that you point the boat against the flow of the tide so that you will have a more controlled approach as the river will effectively be pushing against you. If you were to approach a mooring with the flow of the tide, you would find you were unable to manage the boat and bring it to a halt in a controlled fashion. Reedham river is spanned by a rail swing bridge which even at high tide will not restrict passage for most hire cruisers. However care should be taken passing under as the available channel narrows and if you are travelling with the tide, again you will find it difficult to control your boat at close quarters. Having said all of the above, it should be noted that Reedham Quay has it's own on duty ranger who is there to assist you in mooring and to give advice on how best to leave. Local Attractions: Pettitts Animal Adventure Park - around a mile from the quay side - is a family adventure park with domestic and exotic animals, kids' rides, live entertainment and a cafe. Watching other hire craft coming and going with the fast running tides is an entertaining pastime. Eating and Drinking: Ship Inn - Restaurant and bar food and occasional entertainment. It's terrace overlooks the river and swing bridge. The Lord Nelson also has a terrace overlooking the river and offers restaurant and bar food. 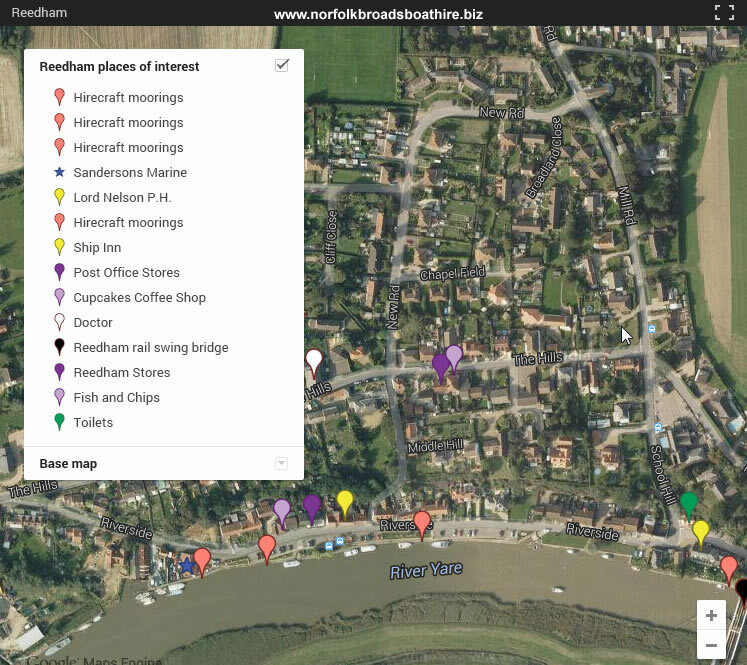 The Reedham Ferry Inn (Restaurant and bar food) is to be found further along the river from Reedham Quay. There is a fish and chip shop up the hill on the street above the riverside. Other Services: A small Post Office stores selling provisions and other goods. Public toilets are available close to the Ship Inn. A Doctor's surgery is located in the village up the hill from the riverside. TIP: If in any doubt ask the ranger to assist you on how to leave your moorings. he will be happy to help. .